Stunning Saturn, Sadistic Sippy Cups, Magnetic Pigeons, and More! 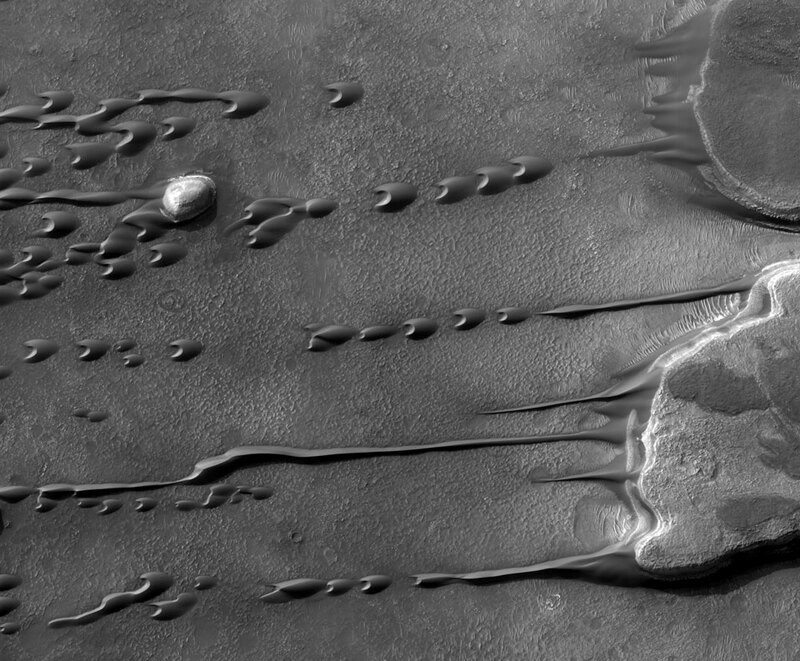 Barchan sand dunes on Mars, from Astronomy Picture of the Day. I wrote about barchans in the Sahara last fall. Oh, what a wonderful week for science this was—I felt like it was all I could do just to keep up with my reading, much less write about it all. A new study has failed to find dark matter in the neighborhood of our Solar System. Obviously, this is one of those striking results that will require a lot of examination! However, I’m with Matt Strassler (scroll down for the bit about the new study): it’s far too soon to conclude that dark matter doesn’t exist. Dark matter models actually work the least well for spiral galaxies (like the Milky Way); we have much stronger evidence for dark matter in galaxy clusters and in cosmology. I suspect I’ll have more to say on this subject later, since it’s me. On a much lighter note, my friend and colleague Greg Gbur recently acquired a Pythagoras cup, which is basically a sadistic sippy cup. If you fill it too full, it drains entirely out through the base! Greg explains the (possible) history and science of the cup, of which there is a surprising amount. Cassini is my favorite space probe in operation today, which is no secret to regular readers of this blog. I have a post about a cool Cassini finding scheduled for Moonday, but in the meantime, enjoy these images and movies of Saturn’s moonlets as they send waves through Saturn’s F-ring. And if that isn’t enough for you, Caleb Scharf posted a really stunning movie created from Cassini and Voyager images, which I have been watching over again for the last two days. A little farther afield, Ed Yong highlighted a fascinating study about how neurons in pigeons respond to the Earth’s magnetic field. Exactly how this works is still mysterious—the neurons themselves aren’t magnetic, so there must be another magnetic receptor somewhere in the pigeons’ anatomy—but it’s a very interesting discovery. Even if you don’t read the whole post (though I hope you do), at least follow the link to see his illustration. Simulating the individual electrons and atoms inside complex materials is too complicated: even for a small number of atoms in the computer simulation, the problem becomes intractable. However, researchers figured out a way to use atoms themselves to simulate other materials, but in a highly controlled way, creating a quantum analog computer.